Gubernatorial candidate Andrew Gillum is ignoring it. The state-wide media will not ask questions about it. But Mayor Gillum’s former chief of staff, Dustin Daniels, is campaigning on it. What is it? It is Tallahassee’s increase in murders while Andrew Gillum was the mayor of Tallahassee. 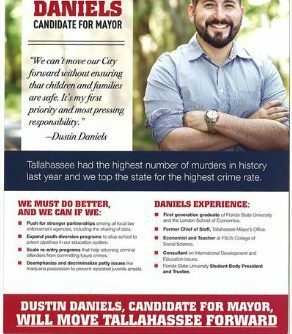 On a campaign mailer, Dustin Daniels, who is running for his boss’s soon to be vacant Tallahassee mayoral seat, is informing voters that “Tallahassee had the highest number of murders in history last year.” See mailer below. “Last year” would be 2017 when Daniels was the chief of staff for Mayor Andrew Gillum. Reviewing FDLE data going back to 1995 shows that there were 17 murders in Tallahassee in 2017, the highest during that 22 year period. Also, the second highest murder total (16) during this period occurred in 2015. Gillum was elected mayor in 2014. Tallahassee Reports has published detailed research on the increase in the Tallahassee murder rate which began to trend upward in 2009 after Gillum and the Tallahassee city commission ignored pleas for help from law enforcement officials. In 2017 the murder rate in the City of Tallahassee was higher than rates in Miami and Orlando. Daniels is referencing the fact that Tallahassee/Leon County has led the state of Florida with the highest crime rate in 2014, 2015, 2016 and 2017. The message put forth by Daniels is at odds with the message of gubernatorial candidate Andrew Gillum, who is telling voters Tallahassee is already doing better due to the decline in crime for the first six months of 2018. In the process, Gillum is ignoring the decisions that contributed to the record setting crimes rates in Tallahassee which include historical highs in murders. 12 Responses to "Andrew Gillum’s Former Chief of Staff: “Tallahassee had the Highest Number of Murders in History Last Year”"
For the uninformed, “Forward” is code for Socialist/Progressive. Leftist politics was totally insane prior to the great Hillary defeat of 2016. I did not think the leftist nose dive would continue this long. But it has. In Dustin’s defense he’s got nothing to stand on except the hill of crap Andrew left him. And he’s doing his best with the cards he was dealt to polish those +urds in that hill of crap he stands upon. You learned the “+urd polishing” skill well under the failed administration of your former boss Andrew Gillum there Dusty!!! “Dang there Dusty those are some real shiny +urds you are selling out the back of your Prius there my man”!! “Can I get one of those shiny +urds for $5.00 as a souvenir”? said Snidely. Typical response to increasing crime rates in most cities is to increase the presence of patrols and/or create a temp or permanent precinct. In Tallahassee, we move the entire police department! Makes one wonder who is financially benefiting from this real estate deal. It is unconscionable that our mayor Andrew Gillum fails to acknowledge that we have a crime problem, does nothing about it, and even lies on national TV on Election night that there is no crime problem in Tallahassee. It is also unconscionable that the editor of the Tallahassee Democrat chooses to be complicit in the crime problem cover up. If I were mayor I would double the size of the law enforcement presence, present law enforcement would receive raises and special training to deal with the situation, and new updated equipment. I would find a way to pay for it. Surely, proper budgeting and a few less contracts to Adam Corey and Sean Pittman would be a start. The greatest sin of all is to be so arrogant and self-serving to not acknowledge it and to even lie about there being a problem. The only reason Gillum is not completely failing in the economy area is due to Trump. Bull crap….I live in the area…it’s not lack of leadership…it’s lack of choices and college towns have these type issues….all of tally needs to do better. 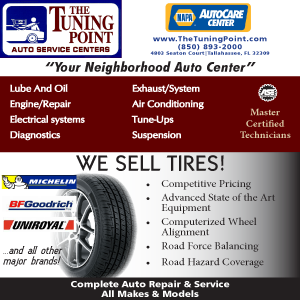 Applyard drive is the place to start. Nothing that cant be solved with more solar panels and student housing. Some commenter posted a couple weeks ago that all 4 of Gillum’s brothers are convicted felons. No idea if that is true, since I haven’t seen it in the Democrap, lol. The Gillum brothers were nothing short of a crime wave. Let’s not forget Gillum’s niece. Gillum has continuously propped up this Chief of Police, while violent crime has skyrocketed on his watch. All the while our Chief is diddling subordinates and touring the nation looking for his next gig. Now the City is facing litigation over a police officer that the Chief fired, because the officer discharged his firearm at a vehicle whose driver tried to kill him. I wonder why violent felons feel emboldened under this administration? Maybe Daniels will have the leadership to demand more from our Police Chief. If so, he will definitely be better than Gillum’s chosen one. He is sn embarrassment and a fraud. This man has never held a real job and by his own words is a self described socialist. I am amazed that the Democratic Party would put power over competence. They should be better than that. He’s an embarrassment and won the primary because the Democrats had too many in the primary. I am in disbelief that some of those credible Democrats are actually supporting this man. Anything for power ? Shame on you and such a disappointment that you would sell out and leave our great State in a mess. Wow….u people always make me laugh… The three ring leaders Hope, mavrick, and that old guy sningles…. Cant be for real… This is classic tomfoolery…..